On the replica complexity scale, Seagrave Aerialsopes are higher than most. Our goal with each release is to improve in every area...so that our customers will notice something new each time they view the model. 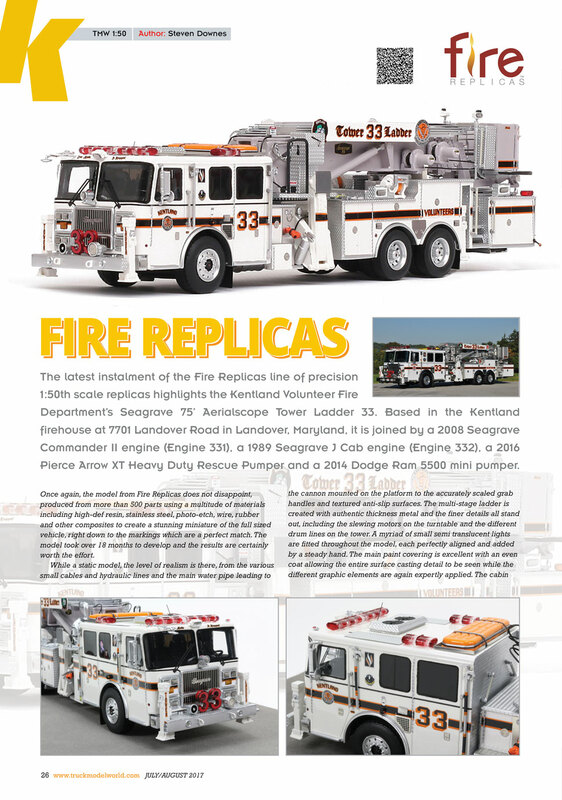 Over 18 months of development has been invested in the Kentland Tower 33 Ladder replica. Countless hours of design, proofing, and improvements make this replica museum grade. Production of Tower 33 is limited to 350 units. Fire Replicas are designed with the elite collector in mind, and manufactured in limited quantities to enhance future value. 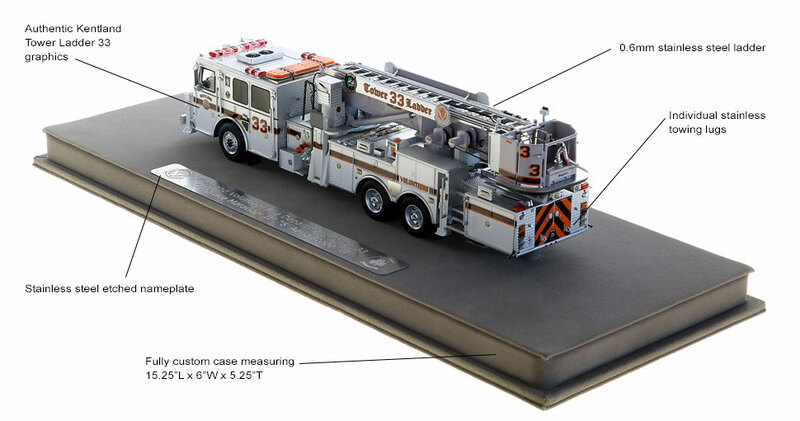 Tower 33 measures 10.5"L x 2.5"W x 2.75"T and is securely displayed inside a custom case. The case dimensions are 15.25"L x 6"W x 5.25"T and the platform includes an etched stainless steel nameplate with the Kentland seal, department and truck name. This Kentland Volunteer Fire Department Tower 33 scale model is a museum grade replica. Like all Fire Replicas models, every detail is modeled to perfection and with razor sharp precision. The replica features the specific department configuration and graphics, leaving no detail overlooked. The display case is custom manufactured with high quality acrylic and resin. The stainless steel etched plate features the department and truck name, and department seal. This replica is a treasure to be displayed and admired and is in no way a toy. In the late 1980’s, the membership saw the need to supplement the station’s Engine Company with an equally formidable Truck Company. The original Tower 33 was bought in 1987 from an auction in NYC, where it had served with distinction during the “War Years” as FDNY Tower 17 in the South Bronx. Where the previous owners saw a worn out fire truck at the end of its serviceable life, the visionary leaders of the KVFD saw a diamond in the rough; after purchasing the unit, they drove it to Maryland to begin restoring it, stopping several times along the way to make field repairs and replace tires, as one dry rotted wheel failed after another. The members undertook the monumental task repairing and repainting the weary rig in-house, and while the CF Mack 75' Baker had seen its fair share of fires before coming to Kentland, it only got a short break before going right back to work. The first run she took from Landover road was a working fire, and the paint and striping hadn’t even been completed yet. That year "Truck 33" totaled 410 working fires. In 1994, Captain Mick McKenzie led the refurbishment of Truck 33, taking the original boom, basket, hydraulic components and placing them onto a FWD cab and chassis, breathing new life into the rig. Tower 33 would go on to provide over 15 more years of service to the KVFD, responding to thousands of working fires and dozens of multiple alarms. Because of its proximity to the District of Columbia, Tower 33 also operated at the Pentagon on September 11, 2001 as part of a multi-alarm firefighting and rescue effort at the headquarters of the Department of Defense. On August 13, 2010, “Sally”, as the rig was affectionately known, was put out to pasture on Long Island, where she was again refurbished so that she can quietly serve out the rest of her life as Tower 7-6-11 of the East Quoge Fire Department. Thanks in part to a FEMA Assistance to Firefighters Grant, Kentland placed its 14th Seagrave, a 2011 Marauder II 75’ Aerialscope Tower Ladder, in service on October 18, 2011 at 17:00 hrs. The first working fire came just 19 hours after placing the Tower in Service, and on the way back from the run the members decided to give the new Tower the nickname "Lucille". This is my first time ordering a Fire Replicas Model, and my first impressions were very good! The shipping process was fast! The item was received within 48 hours of order. The item was packed very well, though there were signs of UPS shipping mishandling, the box that the model came in showed no signs of damage and the model was pristine. The replica also came with a hand signed note which is a bonus! The model itself is very detailed and I am highly pleased with the quality. There are slight imperfections noticed which is why I'm not giving five stars, however, they are very small and you have to look hard to notice them. I highly recommend this model for any scale model, or firefighting enthusiast and definitely see myself purchasing more in the future! As a late comer to buying Fire Replicas I was thrilled to see the level of detail on this one. truly amazing and a job well done. Great model, will to buy again. 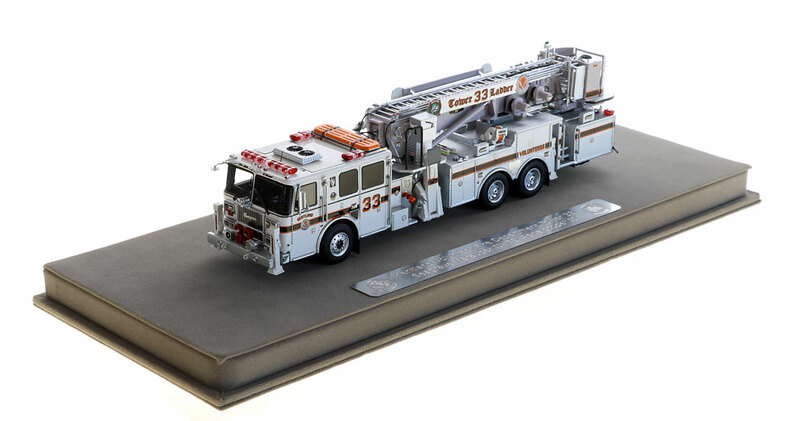 Very detailed and happy with my product would love to have a replica of their rescue 33 engine. 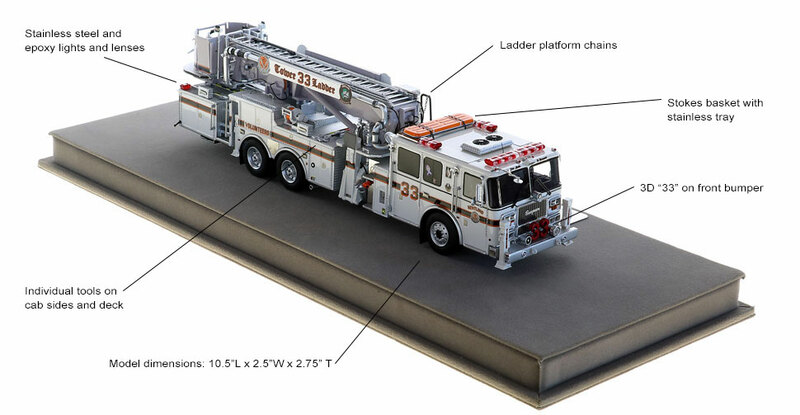 Recently received this model of Kentland Tower Ladder 33 after a nearly 2 year wait from the day I originally pre-ordered it when it was first announced. I couldn't be happier with how it turned out as a completed project. The detailing right down to the tools mounted to the outside and replicas of the window decals are spot-on. 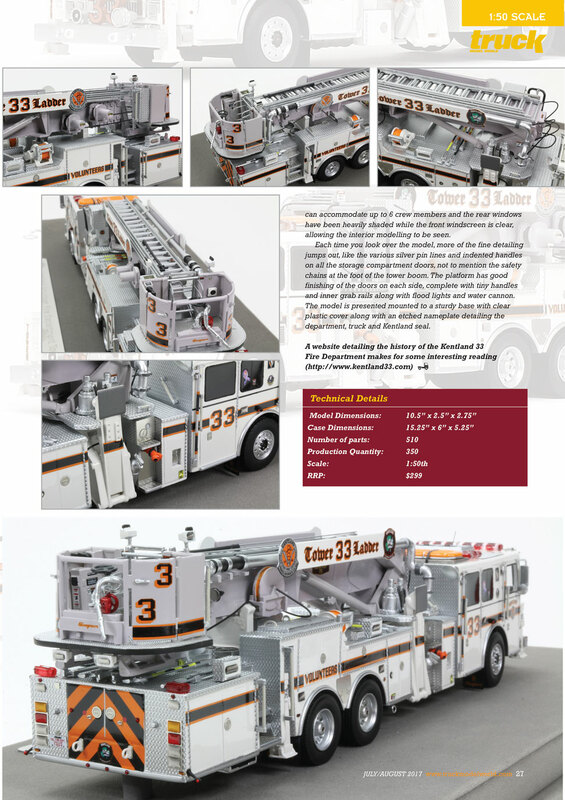 Having had the opportunity to see the real Tower 33 in person as well as to ride in it, I could only find one tiny detail that's missing on the model from the real tower which is a Mack bulldog mounted behind the 33 on the front bumper. No complaints, however, as this is such a tiny detail that is hard to replicate in such minute detail. I can't wait to see what Fire Replicas comes up with next that I just can't pass up. Keep up the great work and I hope to see something in the future that's local to me.